“Red Herring,” which is based in Boston during the 1950’s Red Scare, follows the intertwined stories of three different couples in search of happiness in the midst of conflict. Although it tackles a murder mystery, nuclear bombs, and lovers with differing ideologies, the play highlights humor and fun in the midst of complex relationships. Set as a comedy, the noir atmosphere of the plot pokes fun at itself, following relatable and quirky characters and ending many scenes with dramatic musical stings. While there are 18 different characters in the play, only six people comprise the cast. In order to accomplish this, actors adapt and change clothes quickly to play more than one character. For example, Lauren Myers, a first-year, plays three different women who all have distinct personalities. She notes that some aspects of characterization are harder than others. This year’s performance of “Red Herring” is unique in that half of the cast are new to Goshen College. 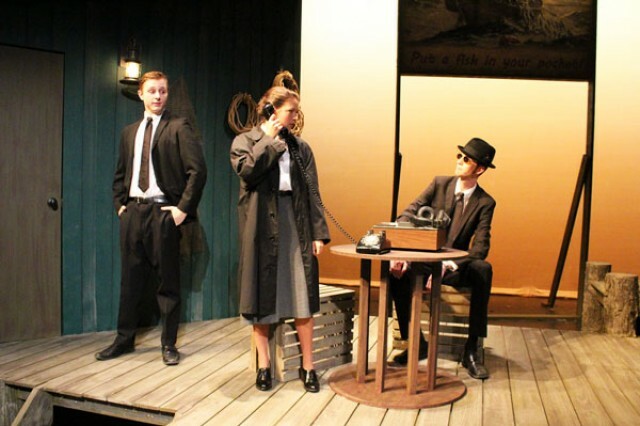 For Myers, Ian Keim, and Olivia Smucker, all first-years, “Red Herring” is their first show on the Umble stage. Joining them are theater veterans Peebles and Lea Ramer, seniors, and Ben Reimer, a sophomore. It is clear that the cast has fun together, on and off stage. Myers stated that theater at Goshen has been a great place to make friends and establish a community. “Theatre at GC has been one of the most rewarding experiences in my short time being a Maple Leaf,” she said. There is no doubt that the synthesis of the cast and crew are reflected through the quality of the show as a whole. Student crew members include Ben Meyer Reimer, Riley Woods, Rachel Buckley, Cristina Jantz, Jonah Yoder, Nick Peebles, Tabitha Immanuel, Zach Ganger, Lukas Thompson, Samantha Horsch, Claire Mitchel, Morgan Yordy, and Mary Seeck. Smucker encourages students and faculty who are in need of a “good, old-fashioned, de-stressing laugh,” to come check out “Red Herring” this weekend. The show opened this past weekend and will finish up this coming weekend with performances on Saturday, Nov. 19 at 8:00 p.m. and Sunday, Nov. 20 at 3:00 p.m.
Tickets are $10 for general admission and $5 for students/seniors/GC employees, and they can be purchased through the Welcome Center or at the box office in Umble Center before the show. This show also counts for convocation credit.